Kiteboarding is a surface water sport which combines different aspects of wakeboarding, windsurfing, surfing, paragliding, skateboarding and gymnastics together into one extreme sport. Basically a kiteboarder harnesses wind power with a large controllable power kite and is propelled across the water on a kiteboard similar to a wakeboard or small surfboard, sometimes with and sometimes without footstraps or bindings. 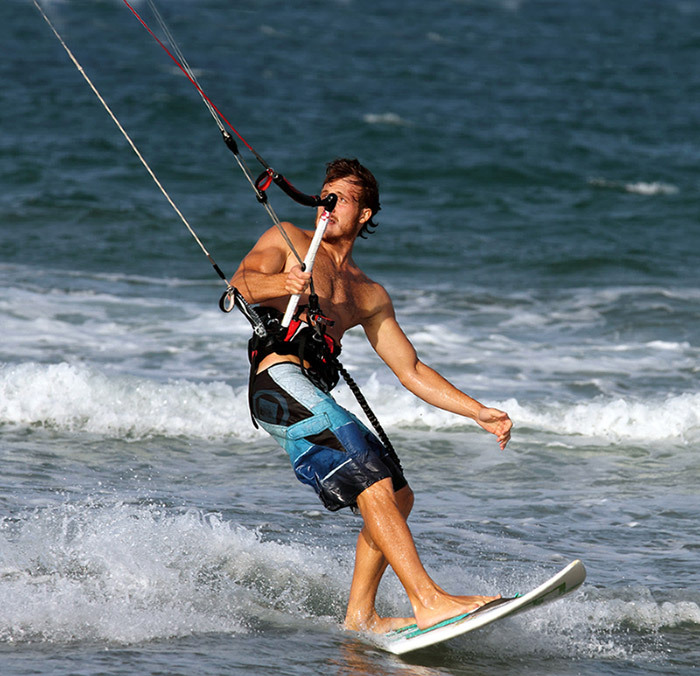 Kitesurfing is similar to kiteboarding but it is more specifically wave riding, almost always utilising standard surfboards or boards which have been shaped specifically for the purpose. In the year 2012 it was estimated that there are at least 1.5 million people worldwide practising the sport but it is still a relatively new activity which only really got going fully in the 1990s at least in this part of the world. Initially it was done only by experienced windsurfers but today many people learn to kitesurf without ever going windsurfing. The Netherlands attracts many kitesurfers because of the fairly regular winds which blow on the coastline and there are festivals, competitions and dedicated schools in many Dutch towns and beach resorts to serve this ever-growing and very popular extreme sport. 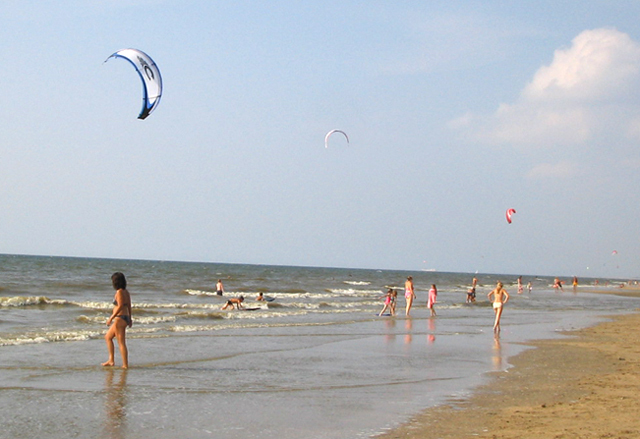 Zandvoort beach plays host to many regular kitesurfers. One of them is Okke Engel, a Dutch kitesurfer with his own kitesurfing school whom we interviewed and filmed kitesurfing off the Zandvoort coast.